This workbook provides every dictation assignment, comprehension question, and reading passage that you’ll need for a full year of study. 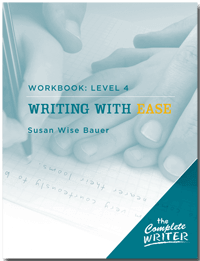 Using passages and sentences from classic children’s literature, the Level 4 Workbook allows young writers to practice their skills while absorbing the style and grace of great authors. My child is going into 6th grade and we have been doing First Language Lessons level 4. what you recommend I get next for Language and writing. Please advise. Im a homeschool Mom who has to choose curriculum for the fall. Hello…for grammar, for people who are finished with First Language Lessons #4, we recommend Voyages in English, Shurley Grammar, or Saxon Grammar (sometimes called Hake Grammar), or the older-but-still-useful curriculum “Rod & Staff.” For Writing, the student may be ready for our middle-grades “Writing With Skill” curriculum. In the near future, we will be releasing our own middle-grades Grammar curriculum, “Grammar for the Well-Trained Mind,” but it is not yet in print, so if you need to pick one in the next few weeks, the ones I listed are your best options. Hi. We live in Armenia and my kids go to Armenian school, but they also speak English as native speakers as their father is American. Now they are in 5th and 4th grade. We have done Writing with ease 1 and 2 with them years ago but then stopped homeschooling and sent them to school. We want to start an English program for them, as we are not satisfied with the level of English at their school. I was looking at Writing with ease 3 for both of them. What would you recommend? Yes, at that age/grade level you could do Writing With Ease #3 with both of them. Take a look at the sample we have online…if it is too simple for them, you could easily skip ahead to #4. I have a 5th grader entering 6th grade who struggles with writing. Should I start him with writing with ease level 3 or 4? My Son is 8 years old (9 this summer) and has been using Level 3 for Writing with Ease as well as Level 3 for the Language Lessons. He was doing very well with no problems (except that he is a bit slow in writing manually and average in spelling), and he is an excellent reader. He loved all the stories and did very well in memorizing the poems in Level 3 for Grammar. He found some of the Grammar work repetitive but he did not make mistakes in it. However, because of some family circumstances we were not able to finish the entire book of Language Lessons Level 3. Would I be able to move him on to level 4 anyways for the Fall? Or do we have to finish the book first in order to be ready for level 4? He is above average in Reading and while he has some attention issues, he is very bright and gets almost perfect grades every time. Thank you so much for taking the time! I have six children and am trying to get organized quickly for the Fall and our Government Review! It would be best if you can go ahead and complete the Level 3 book, just to make sure he has a firm foundation in that level of grammar before moving on to level 4…maybe do a lesson or two each week during the summer? However, if you have to go ahead and move on to Level 4 because of your local/state gov’t requirements, that’s fine. Level 4 includes some review of what has come before. Just be prepared to go slowly for the first couple of months, if you skip ahead to #4. My son is going into 6th grade. He has not had a fantastic writing program in the past. I’m really unsure where to begin with the writing.